When I was about 11 or so, I got a pogo ball. It was purple and green, and I immediately invested massive amounts of time in becoming proficient. We lived in a neighborhood at the time, and I practiced going up and down the sidewalk in front of my house. I was relentless. 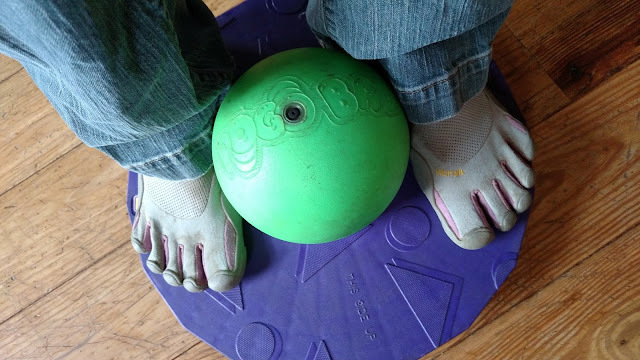 So perseverant that I pogo balled until I had massive blisters on the insides of both feet from gripping the ball (even though I'd been wearing tennis shoes). But my persistence paid off. Soon, I could pogo around the entire block. I could pogo uphill and downhill and even up and down the curb. Not long ago, I was in a thrift store and came across a pogo ball for $1.25. It was the same color as the pogo ball I had in the 80s. I hopped on, not expecting much. But my mind and body? It remembered how to pogo ball, all these years later. I was hopping all over the store. A child in a forty year old body. I brought the pogo ball home. My boys were very impressed with my mad pogo skills. And, as you might imagine, they're working on some mad pogo skills of their own. Readers, do you have any skills from your youth you'd like to revisit? ...pogo balls came way after my time. We had pogo sticks and I laugh when I want to always try one when I see it. Unfortunately they don't hold my weight. When I was in middle school, my sister learned to ride our neighbor's unicycle. I was NOT to be undone, and mastered it one summer. I eventually graduated to a "giraffe", which is a 6' tall unicycle. To get on it I would stand on the tailgate of my Dad's truck and hold onto the rafters of the garage. So much fun! I can still ride it (!!) but don't very often, because my bad back doesn't agree too well to meeting the hard ground in the even of a fall. And yes, our daughter has learned to ride the short one too! I love this shot! I can get a good look at it. Because I have heard the name, but didn't really know what it is! I may get one for our kids if they still sell them, they look fun! I guess it's like riding a bike and you never forget. You were a truly DEDICATED child! I used to be Queen of the hula hoop, and now I cannot do it anymore! And I would love to ride a bike again too. I also was maybe to best in the neighborhood at slating. The kind that had the skate key and you put them over your saddle shoes. Ancient, both them and me! P.S. It's so good to see you again! I know you are needing to slow down your posting, but I hope you never completely stop, I love visiting. That is so cool that your body and mind "remembered" how to pogo. I have never heard of a pogo ball, but I have a feeling I would fall off and break something if I tried it. LOL I would like to have my piano playing skills that I had as a youth. Years of not playing and stiffer joints means I don't play as well now. I can't even imagine the looks on those faces when you demonstrated your "mad pogo skills" - just imagining, i am still impressed and giggling at the fun of it all. Thank you, Thank you for the JOY. Jump rope. Do kids even play jump rope anymore? Or Chinese jump rope? I'm sure it is probably something like "elastic rope" or something more politically correct now. Heh heh! Glad the boys were impressed! How cute! Hah! I love it! Oh my. Memories come rushing in... I was a total biker in my day--jumps, catching air, speed... It was all about the speed. I miss that, but I don't think I could jump back on the bike after my car accident. Life makes us adapt sometimes, eh? I remember the bouncing ball that you sit on,,, and pogo stick. I bet this is fun! I'm un-skilled. Never tried it. Yet. I don't remember those at all. I'm thinking my kids may have been to young for them when they came out. I used to be okay with the pogo ball- but not as good as you. I was great at bike riding and climbing trees- though I couldn't climb a tree now. :) Awesome that you still have your skills and your kids are getting into it too! Well that's a blast from the past! But we called it a different name here in Ireland. I'm wracking my brain to think of the name! That's fun! I was a roller skater, jump roper and hula hooper. I still retain some of the skills, lol, which I think is a hoot. I thought you were going to post about Pogo the Possum! Can't really think of anything from my childhood that has any applicability today. I had one of these too! I loved it. They still make them. I don't know if they are as good as the ones in the 80s or not. Skills? I was good at jump roping, I can make silly faces like no other. I also love to make silly sound effects. Not really too skillful, but more silly. I remember having one of those when I was younger. But I wasn't near as good on it as you were.